The main cause of glaucoma has been complex and not very clear until now. 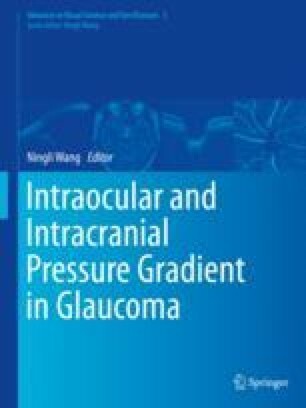 The higher intraocular pressure (IOP) is generally regarded as the high risk factor, whereas recently more and more researches have found that intracranial pressure (ICP) was also a danger factor in the pathogenesis of glaucoma, especially for “normal tension glaucoma” (NTG) in which IOP is at normal levels, but patients also suffer from progressing disk cupping and defect of visual field [1, 2]. Therefore, the elevated IOP alone cannot explain the neuropathology of NTG, and it is not clear what kind of role the ICP play. The contribution of intraocular pressure (IOP) in glaucoma has been studied for many years, but the effectiveness of the intracranial pressure (ICP) is still unknown. Furthermore, the exact correlation between ICP and IOP also remains unclear, specifically the relationship between ICP and the optic nerve subarachnoid space pressure (ONSP) [3–6].